Mary Medrano loves dogs - and it shows in her work. "Dogs are a favorite theme of mine," said the Bend artist, whose work will be featured at Sisters Art Works in the annual Dog Show. Madrano will be on hand for an artists' reception from 5 to 9 p.m. on August 9. "I'm so happy to be in the show again," she said. "It's great." 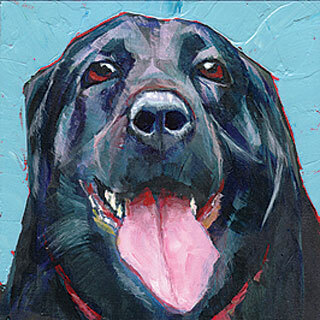 Medrano specializes in pet portraits and animal paintings, done in acrylics on panels. Her portraits feature friends' dogs, and they capture the spirit of the furry friends, even if they're not exact depictions of the specific animal. "They're not photo-realistic," she explained. "Expressive realism is what I call it." "The Dog Show: A Fetching Display of Canine Imagery" is part of a celebration of canine companions during the "dog days" of August. Things get underway with the Sisters Doggie Dash on August 3. This family event will be held from 8:30 a.m. to noon on August 3 at SPRD and includes a 5K run or a two-mile stroll with your furry friend. The path will be well-marked and follows along forested trails west of SPRD/north of the McKenzie Highway. The event includes a canine carnival where you can learn some handy training tips from professionals, watch greyhounds race in a special lure course and let your own dog participate in the course. The Humane Society of the Ochocos will be there with dogs to adopt. ation.com prior to the event. There will be an additional $5 charge to register from 7:30 to 8:30 a.m, on the day of the event. An adult must accompany all participants under 16 years of age. Your canine friend must be at least four months old and have proof of rabies vaccination and be kept on a leash at all times. All participants will receive a Doggie Dash T-shirt and dogs receive a doggie goody bag. The first 70 dogs to sign up will also receive a Doggie Dash collectable bandana. This event is sponsored by the Friends of the Sisters Library partnering with SPRD, the Furry Friends Foundation, The Dog Show and The Nugget as a fundraiser to help support the library services, including the children's early literacy programs.